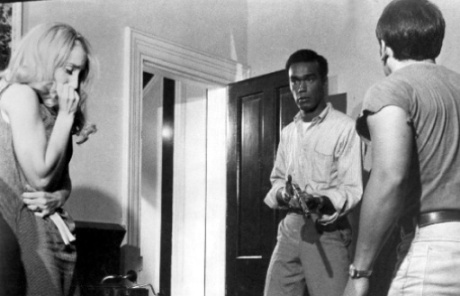 Originally conceived as an ersatz adaptation of the Richard Matheson novel, I Am Legend, after comic drafts of the screenplay involving space aliens were scrapped, George A. Romero's Night of the Living Dead opened with controversy and subsequent success, earning nearly $12 million ($18 million, internationally) on a $114,000 budget. Criticized for its gratuity and casting of a black man as the central hero (it was 1968, after all), this tale of ghouls (the word "zombie" is never uttered in the film) rising from the dead to eat the living inspired an abundance of discourse and intrigue, making it a substantial work of cultural relevance. Though simple in plot, taking the inception route of the I Am Legend premise, following a small group of people trapped in a farmhouse while the undead wander about, looking for human to eat, Romero's feature film debut inspired metaphorical comparisons to capitalist critique. Mindless consumption is the motivator for these ghouls, much as the subjugated, or different (living), were their targets for assimilation and/or death. More superficially, this socio-cultural work of deceptive simplicity brought up issues of censorship. Upon release in October of 1968, the MPAA system was not yet in existence, leaving matinee viewing audiences of pre-teens to witness gratuitous cannibalism on screen, which was exacerbated by an emotional trajectory of despondency and eventual defeat. Also controversial was the implication of military incompetency and disillusionment with the media and government agencies, noting the race angle and political climate of Cold War paranoia. As the ghouls slowly pick off (no pun intended) every character in the film, giving the work a nihilistic sensibility, there's a sense of isolation and lack of greater protection or organization external to the enclosed farmhouse, reiterating base annihilation anxiety as exacerbated by (contextual) parental shortcomings. This notion is exemplified during the final moments when the potential sole survivor, a heroic black man, is assassinated (think about the times and that word) by law enforcement agents out to "protect" and "serve" (their own needs). In such, this dated horror movie beholds an endless bounty of topics and themes for discussion, making it relevant necessary viewing for anyone keen on a film and cultural theory.